Guess What We Did! We Took Our Favorite Dip And Turned It Into A Pasta!! Okay, so some people look at dip like it’s no big deal, it’s just kind of there for them, but we are not one of those people. We love, love, love dip and think it’s such a versatile dish that you can never go wrong! Plus, no one ever complained of having too yummy a chips-and-dip session! 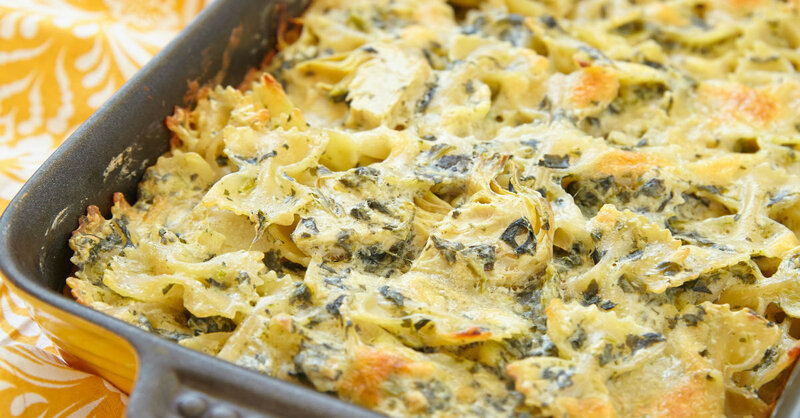 With that in mind, we wanted to find a way to recreate our favorite, spinach and artichoke dip, and breathe some new life into it…that’s when we decided to turn it into a baked pasta. Seriously, we could not be more pleased with the results, because this dish is a knock-out – try it out and you’ll see what we mean! Cook pasta according to packaging directions, or until al dente, then drain and set aside. Heat 3 tablespoons butter in a large skillet or Dutch oven over medium-high heat. Add minced garlic and cook for 1-2 minutes, or until fragrant. Add drained (or fresh) spinach and cook until coated in garlic butter (and/or wilted). Season generously with salt and pepper, then transfer spinach to a plate and set aside. Add artichoke hearts to skillet and cook until browned. Then remove and set aside. Melt remaining butter and sprinkle in flour. Cook, stirring frequently, for 2-3 minutes, or until roux is smooth and paste-like. Continue to stir and slowly pour in whole milk. Let cook for 3-5 minutes, then mix in mozzarella. Stir until sauce is smooth. Return spinach and artichokes to sauce, then fold in pasta. Transfer everything to a large baking dish, then sprinkle parmesan cheese over the top and place dish in oven. Bake for 15-20 minutes, or until sauce is bubbly, then remove from oven and serve hot.